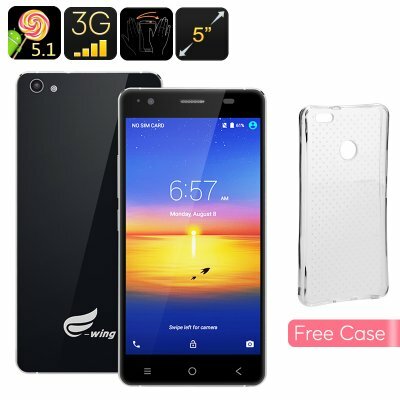 Successfully Added Ewing E9 Android Smartphone - 5 Inch 720P IPS Display, Android 5.1 OS, Quad Core CPU, Smart Wake, Gesture Sensing (Black) to your Shopping Cart. With its front and rear 2.5D glass coating, along with the alloy metal frame the Ewing E9 has real appeal with it shiny reflective surfaces it's a real eye catcher. underneath that lush exterior is a quad core CPU so the phones ready for plenty of action and can take on all your daily Smartphone needs. A Mali GPU pairs nicely with the 1GB of RAM and ensures the phone is able to handle graphics efficiently so movies and games will both run fine. A 5 inch IPS screen with minimalist bezels means there is hardly any lost room and keeps the phones profile compact to conform to easy one handed use. For more efficient usage the phone features smart wake and gesture sensing that both pair nicely with the Android 5.1 interface making for a fully enjoyable and intuitive user experience. With its fixe metal case the 2200mAh battery is fully enclosed in this -phone and brings up to 8 hours of continuous usage time so you will have enough power to keep you going all day. Thanks to the dual SIM support you can enjoy multiple numbers at the same time on the Ewing E9 or alternatively swap out one SIM for a micro SD card which can expand the storage by up to 32GB. Make the most of the expandable storage for sorting movies, or download games from the Google Play store and still have plenty left over for photos and HD videos that can be recorded direct from the phones rear camera.